In my days of playing in acoustic bands, people would come up and ask me if the instrument I was playing was a ukulele (it was a mandolin). To me, that was kind of like mistaking War and Peace for a coloring book. But I understood. Not everybody knows the name of every slightly unusual acoustic instrument out there. Another common mistake is to call every acoustic band you hear a “Bluegrass” band. When I got more and more into acoustic music, I found that I was drawn to a particular style known as Old Time music. I like that name, but it is rather misleading. If you told someone completely unacquainted with acoustic music “I like Old Time music” they might assume any number of things. Perhaps anything from big band jazz to Frank Sinatra to Renaissance harpsichord music. More likely, they’ll think of Bluegrass. They might even tell you about how there is this bluegrass festival near the town they grew up in, but they never went. Old Time is none of these things, although it shares closest kinship to Bluegrass. To understand the difference, it is probably easiest to first understand what Bluegrass is. The story goes that Bill Monroe invented the style of music in the 1940’s. His band was called The Bluegrass Boys, after the slogan of Kentucky. It wasn’t until maybe 20 years later that people started copying the style of Bill Monroe’s sound enmasse. There were festivals popping up all over at the time, and a descriptive term was needed, a name for the genre. Hence, “Bluegrass”. 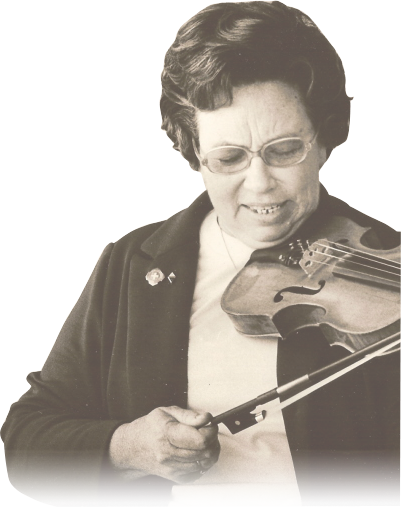 You’ll hear this story over and over even today at Bluegrass Festivals. What was Bill Monroe’s sound? Well Bill Monroe was a mandolin player, and one of the distinctive roles that the mandolin played in this style was a “chucking”, or a quick chord strike on the off-beat of the music. Bill went through many different musicians, but one genre-defining name was Earl Scruggs. Earl played the five-string banjo with fingerpicks and a three-finger style where all the strings were plucked in sequence. This has become known as Scruggs style banjo playing and is still dominant today among bluegrass banjo players. Bill was also known for his “High Lonesome Sound”, which is a good way to describe the vocals in his music and bluegrass today. Vocals tend to be in a fairly high register, especially for males, with many songs in the high key of B (“B” is for bluegrass!). Perhaps one of the most important traits of bluegrass is harmony singing. So that’s Bluegrass. How does that differ from Old Time? Old Time is the kind of music that was going on before bluegrass, in the Appalachian hills. This music was often played on porches and at square dances. The songs were based on well-known melodies, but could go on for really long periods. “Solos” just aren’t necessary. Entire songs are almost like solos, in that the musicians are constantly throwing their own variations and flair into the melodies. The songs ebb and flow as a whole, rather than follow standardize compositions. Singing is often in short phrases broken up by long instrumental periods, and harmony is less common. Melody is very strong, with fiddles leading the party. Mandolins are rare, but if present, also are predominantly melody. Guitar and bass are very consistent and do very little melody. Even things like walking a chord transition is enough flair to go a long way. The banjo is perhaps the most distinctly different. Instead of plucking the strings as in three-finger style, the hand is held in a claw shape and the fingernail strikes down on the strings while the thumb pulls the drone string. There are many variations, but this still of banjo is known as clawhammer or frailing style and may be the easiest way to distinguish Bluegrass from Old Time.